What Exactly Is A Smart Meter? Smart meters, are a newer version of the electrical meter that you’re used to on the side of your home or apartment. They are most often associated with electrical meters, but they can also be used to measure things like gas and water. When I was a kid, I remember the electricity company coming by every so often, politely letting himself through the fence, and checking our electrical meter to see how much we had used. Have you noticed that doesn’t really happen much anymore? 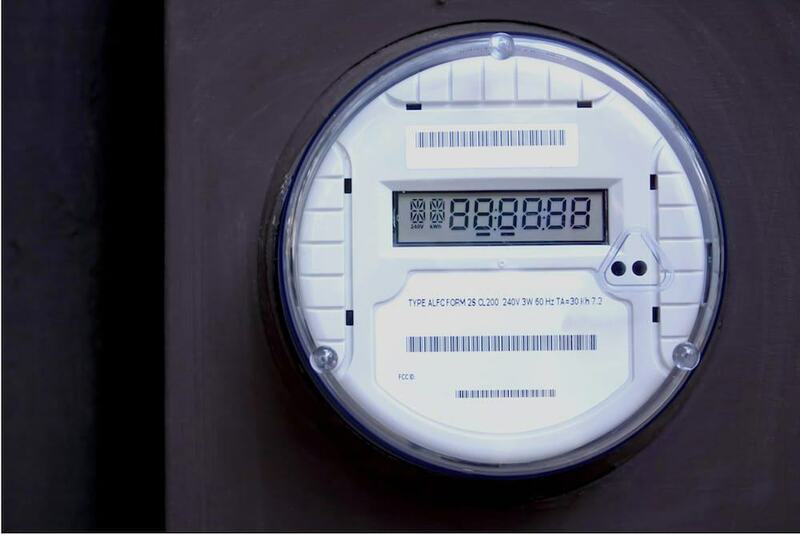 Well, this is the biggest reason utility companies want all meters to be smart meters. These meters transmit their readings wirelessly, and the majority of them are two way, meaning the utility company can also transmit signals to the meter. This allows these companies to do things like turn your power off, or shut your gas off, remotely. The meters I grew up with as a kid were analog meters. Analog meters have been proven to not only be effective, but completely safe, and there what we used for over a hundred years. They don’t have any of the safety, health, fire, or privacy risks that smart meters have. Sometimes these meters were a for of Analog meter, called an “ERT” meter, and does have a transmitter. This helped the utility companies because instead of the driver having to walk up to the meter to read it manually, a signal would be sent from the meter to the truck as it drove by. Since the signal was only sent once a month as the truck drove by to check, it is and was a much safer option than smart meters, who are transmitting information 24/7 365 days a year. These meters are the first type of actual smart. They only transmit one way, typically to some kind of utility truck that is driving by. The reason that these AMR meters are different than the ERT analog meters, is that they are constantly pulsing with radiation so that no matter when the truck drives by, the signal can be picked up and read. In this way, it isn’t much better than modern smart meters that transmit all the way back to the utility companies server, because they are still constantly emitting EMF radiation. You certainly wouldn’t want to this meter on your house, and especially not anywhere near a bedroom or where you sleep or spend a lot of time. This is what we know today as “Smart Meters.” The main reason for this is that these are the only meters that communicate both ways. Utility companies can control the meter remotely. This allows them to turn your electricity or gas off, update the firmware on the unit, and collect your usage at any point in time. These meters have consistently shown to be enormous hazards to our safety, health, well-being, security, and even privacy. Smart meters have started hundreds of fires and injured more people than we know through the constant EMF radiation exposure. What Makes Smart Meters Dangerous? Typically, your smart meter will be part of a local system. Your home or apartment meter will transmit to a neighborhood or nearby antenna along with all the other ones nearby, and then all of that information is transmitted to the utility company. These signals use a type of radio frequency, which produces microwave radiation, similar to the EMF radiation that is released from your cell phone or home router. The type of radiation these smart meters produced is often called non-ionizing microwave radiation. Your utility company will try to tell you that because it’s non-ionizing, it’s not dangerous. This couldn’t be further from the truth. This non-ionizing microwave radiation does penetrate the walls of your home or apartment, and enters your home all day long, all year long. This type of radiation breaks apart DNA molecules and damages the cells. While under the stress of this smart meter EMF radiation, the body has a hard time making perfect cells. These broken cells have been shown to cause all kinds of illnesses. See my post on EMF exposure symptoms to see a bunch of issues EMF radiation can cause. Smart meters are an enormous producer of EMF Radiation, are also talked about in my article about EMF radiation and male infertility. Many people are especially sensitive to EMF radiation. This sensitivity is typically called EHS, or Electromagnetic Hypersensitivity. These individuals will experience all kinds of adverse effects to smart meters, like headaches, fatigue, sleep problems, mood disorders, heart palpitations, anxiety, and much more. Almost a third of the population has at least a mild sensitivity to EMF radiation. If you think you may have EHS or some of the symptoms, read my article on EHS disease – do I have it? Or, for some absolutely great information about EMF radiation, check out Nicolas Pineault’s The Non-Tinfoil Guide to EMFs, which is my absolute favorite e-book on the subject. Are Smart Meters Even More Dangerous Than Cell Phones? Hirsch found that the cumulative exposure of a smart meter is more than 160 greater than that of a cellphone. Now to be fair, he measured exposure at 3 feet, but look at the chart below to get an idea of just how dangerous AMI smart meters are to public health. 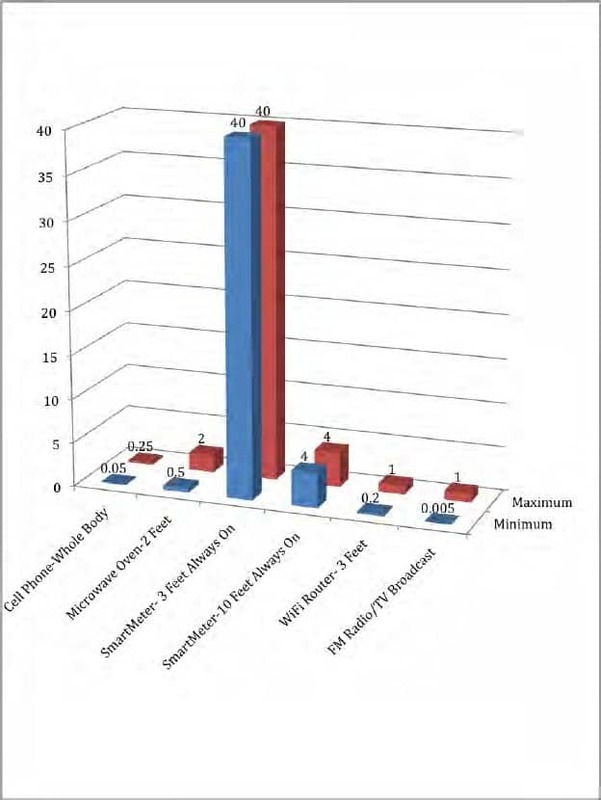 This chart is a comparison of EMF exposure damage from multiple sources. although the scary high chart is a smart meter at 3 feet, draw your attention to the smart meter at 10 feet, compared to a cell phone. Even the minimum exposure from a cell phone is still 80 times less than the minimum exposure from a smart meter at 10 feet, which is less than the distance through the wall into your bedroom or your child’s room. We choose many of the EMF radiation risks around us, like our cell phones, routers, microwaves, etc. One enormous problem with smart meters is that we don’t choose to have them on our home, the utility companies do. This is not only a massive invasion of our privacy but a proven health hazard. Can I Opt-Out of Having A Smart Meter? This largely depends on your state. This is an ongoing battle nationwide, and people in nearly every state are fighting either to have an opt-out law or to fight discrimination against charging customers extra for opting out. I put together a list of the states I believe do have an opt-out law or clause, be aware though, that although you may have the legal right to opt out of a smart meter in these states, many utility companies can legally charge you extra for doing so. If you have a correction to my list, please email me at [email protected] It is difficult to keep up with what is happening in each state since this is and will be, an ongoing battle. In my opinion, there are a few ways to know if you have a smart meter, and each one comes with an increased level of certainty. The first thing you can do is to have a look at the meter, if it looks anything like the picture to the right, or says “PG & E Smart Meter” on the label, you probably have yourself a smart meter. I put this one kind of low on the certainty list because it’s not a sure thing. 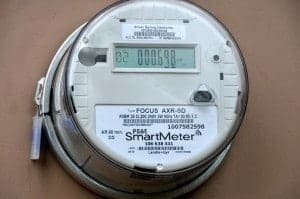 There have been reports of meters looking like analog meters, but having retrofit transmitters that work and function exactly the same as a smart meter, but don’t look anything like it. The second thing you can try is calling and talking to your utility company. Ask them if the utility meter at your address is an AMI smart meter, and see what they say. I put this one first because there have been plenty of reports of these companies being quite deceptive. The third thing you can do is get a quality EMF meter (which you should honestly already have), like the new TriField TF2 (read my review). You can use the meter to measure the various radiation levels coming from your meter to determine if it is transmitting and creating harmful radiation. 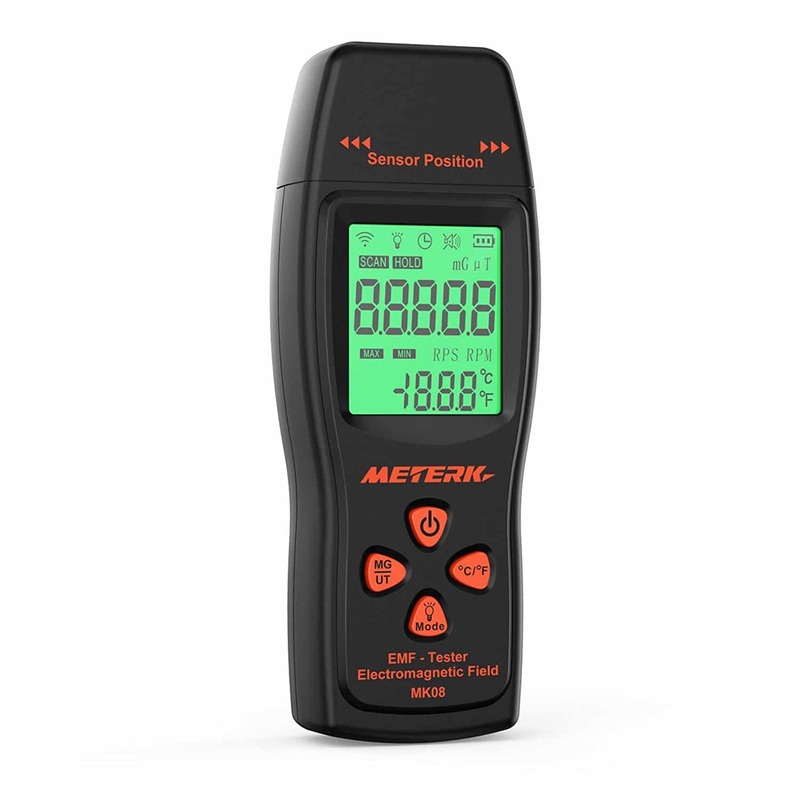 The advantage of having an EMF meter like this is you can use it to help friends, family, co-workers to determine the same thing. If you grab the Trifield Meter after reading my review, set the dial the radio frequency setting, and determine the level of output. If that needle jumps up a bit as you walk up to your utility meter, you know what you’ve got. It may be smart to document your reading by having a friend or family member filming you take it. If you ever want/need to opt-out or complain to your utility company, this could be important to have. Lastly, but most costly, would be hiring an EMF consultant to come to your home and take readings. 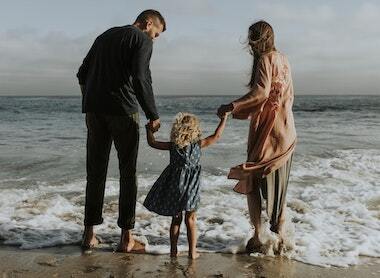 For the vast majority of people, this is not necessary, he won’t do anything different than you would with your own EMF meter, except he will take the reading with a bit more confidence perhaps. Well, there are a few things you can do. No matter what you do, it is really important to have an EMF meter to make sure that you are actually helping the situation. You need to take a reading before and after you perform any of these steps. This will help you to know if they are actually making a difference. Opt Out if possible – This one will require you to do a little bit of research and action for yourself. I listed above the states that to my knowledge have opt-out laws, meaning you have the right to opt-out of a smart meter (but may have to pay a monthly fee). I would encourage you to research this for your own state, and either way, contact your utility company and let them know that you do not want a smart meter, do not feel they are safe and would like something done. 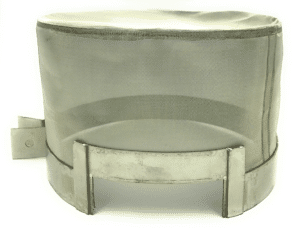 Get a smart meter over (Pick one up here) – They make what are essentially faraday cages specifically for smart meters that block the vast majority of RF and EMF radiation. This is also an extremely simple solution as you basically just slip it onto the smart meter (see image). One issue here is that although it does dramatically lower the radiation, they can only slip over the back of the unit, so you can expect some radiation coming in that direction. This is another reason to grab an EMF meter. Not only will it help you to confirm the radiation coming from the unit, but you can also go into your home or apartment and read the amount of radiation coming through the walls. Get some EMF protection Paint – This works well in combination with the smart meter guard. They make paint that will act as a shield from the EMF radiation, to paint on the wall behind the smart meter. Try to be as thorough as possible with the paint on the entire side of your home or apartment that shares the wall with the smart meter. You can get a big bucket of the paint from Amazon, or if your budget is a bit tight, they also have a convenient little bottle. Smart meters are extremely dangerous, and the World Health Organization has classified them as a possible carcinogen. If your utility company wants to install a smart meter at your home, here is a great resource on some of the things you can do. If you got anything out of this post, please share it with your friends and family! Not nearly enough people understand just how much radiation is pouring into their homes from their smart meters. Do your part and spread the word! Pennsylvania is mandatory. No opt out. Thanks for this, I’ll look into it and add this to the article! I was going to confirm what Kim said; Pennsylvania does not allow an opt-out: Pennsylvania Act 129. How these Acts pass without a vote is beyond me… don’t we live in a free country anymore?